The old inn "Kanne", which, built in 1632, was one of the oldest in the village, has been operated in the 20th century under various owners until inside. As early as 1695 it was under the direction of the famous Johann Nicolaus von Nidda be extended (cf.. Blackboard 2). The estate included several outbuildings and a large garden. A large barn, which was burned down in 1873, was the last host Linde Meier 1900 rebuild and designing a room. With inflation after the first world war but was the tavern life to a standstill. 1922, the Methodist church, the inn, the room, as well as the large garden. 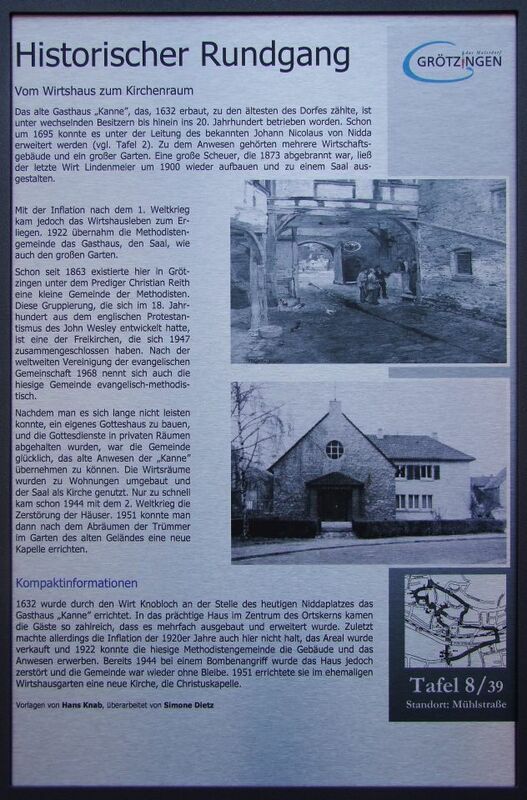 Since 1863 there existed in Grötzingen under the preacher Christian Reith a small congregation of Methodists. This grouping, which had developed in the 18th century from the English Protestantism of John Wesley, one of the free churches that have joined together in 1947. Following the global unification of the Protestant Community in 1968, the local community called Evangelical Methodist. After long it could not afford to build their own church, and the services were held in private rooms, the community was happy to take over the old property of the "Kanne". The host rooms have been converted into apartments and used the hall as a church. Only too soon came in 1944 with the second world war, the destruction of homes. 1951 then you could build a new chapel in the garden of the old site after clearing the debris.